Brussels sprouts are tiny little cabbages. So cute! They are also a commonly feared vegetable. Never fear, the key is to steam them so that they are nice and tender, then toss them with a garlicky vinaigrette. Juicy and light, these Brussels sprouts will win the whole family over. Make this for Thanksgiving this year and tell me who loved it! Brussels sprouts are worthwhile additions to your Thanksgiving dinner and your regular grocery list. They are higher than any other cruciferous vegetable in antioxidants called, glucosinolates. These antioxidants are unique cancer-fighters and detoxifiers because they start multiple antioxidant chain events in our bodies. Brussels sprouts are also high in vitamin K, great for your bones, and stimulate your immune system with vitamin C.
Avoid overcooking brussels sprouts to maintain high glucosinolate content and allow cut sprouts to sit for 5-10 minutes before cooking. This allows the antioxidants to be fully released before exposing them to heat. Overcooking will change the taste of the brussels sprouts, and not in a good way, so watch them carefully when they are steaming. Cut the ends off the sprouts and peel away any brown leaves. Cut the sprouts in half and large ones into quarters. Let the cut sprouts sit for 5-10 minutes while the water boils and you make the vinaigrette. Place a large pot of water on the stove; bring to a boil to steam the sprouts. While the water is coming to a boil, let the sprouts get some air and make the vinaigrette. Whisk together the ingredients for the vinaigrette in a food processor or in a blender. Toss the sprouts with the vinaigrette and serve. 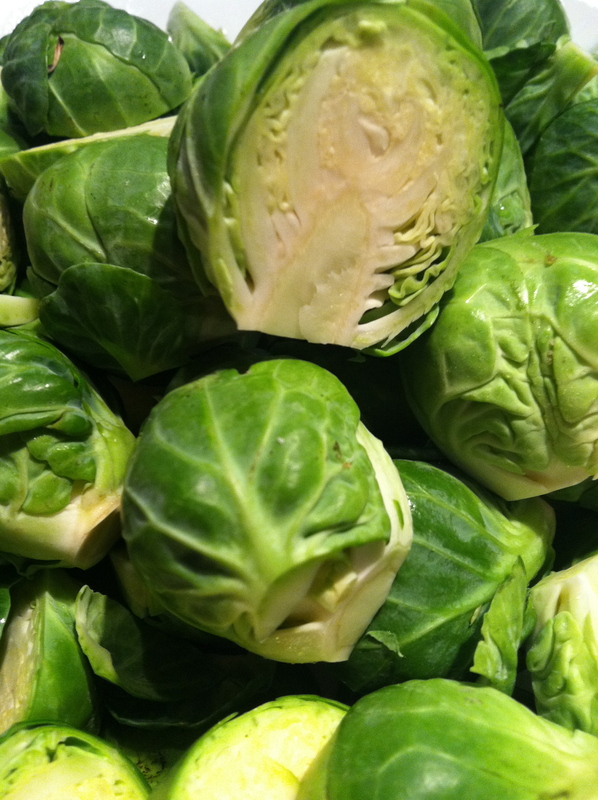 Steam the sprouts up to 5 days ahead of time and store in the refrigerator in an airtight container. Make the vinaigrette up to 2 weeks early and store in the refigerator in an airtight container. Reheat and toss with the vinaigrette just before serving. 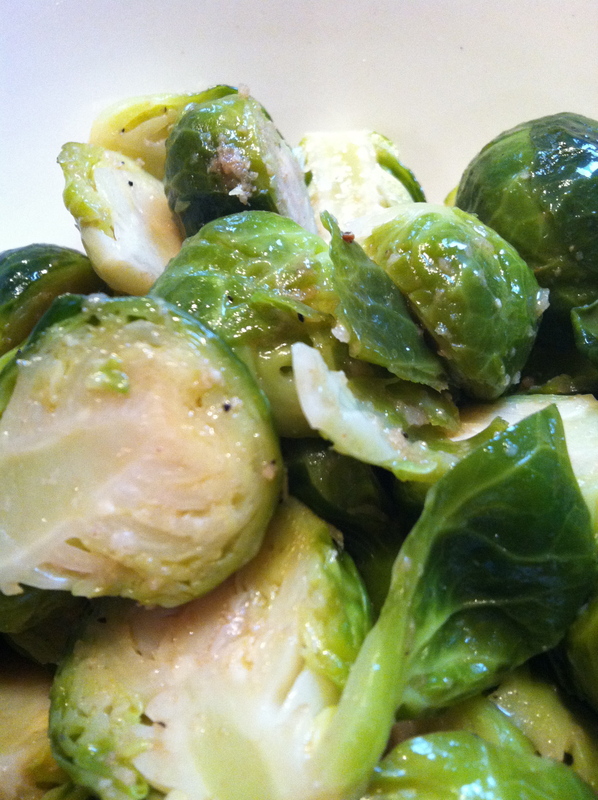 See the sprouts below fresh from the steamer and tossed with the vinaigrette. Brussels sprouts come in season throughout the fall, so they are a wonderful addition to your Thanksgiving table to add a splash of color. These sprouts would be great along side roasted sweet potatoes and a piece of grilled, poached or steamed salmon. Brush the vinaigrette over the cooked salmon to bring the meal together.